What's it about? I absolutely loved Wonder when I read it back in 2013 for my MA. It's a story about August, a boy born with severe crano-facial deformities. He goes to school for the first time for 5th grade as he's previously been homeschooled, and he has to deal with bullies and standing out so much. It's an absolutely amazing novel and if you haven't read it, stop reading this review now and go and find it, because you need to - and because this review contains spoilers. This is a companion book to Wonder, featuring three short stories from three of the kids in Auggie's life. The first story is Julian's, the person who bullies Auggie relentlessly in Wonder. The second one is Chris, Auggie's friend from childhood who has moved away from New York to Connecticut. 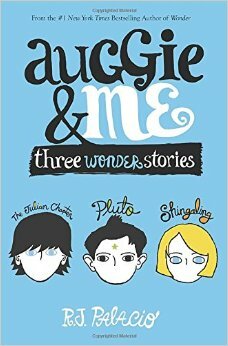 The third story is Charlotte, who was chosen to be one of Auggie's welcome friends when he first starts school. All stories sort of are about August, because each person mentions him a lot, but the stories are also about their lives too. Julian's mum is a nightmare, to be honest, and I think she makes life really hard for Julian and that without her, and his Dad too, Julian would have finally got used to having August in school and wouldn't have bullied him as much. Julian's story went into the summer after 5th grade and told the reader a lot about his background and history. I ended up feeling quite sorry for him. Chris doesn't speak to August as much now that he's moved away and now that his parents are living apart. When he does talk to Auggie, his friends can sometimes make it difficult and think August is a freak. His story takes place over one whole day, and includes both his parents. It was quite short, but deftly done. I would have liked to see Chris interact with August more, really. Charlotte's story is about the trials of 5th grade as a girl who isn't that popular and who is thought to be a goody two-shoes. She and her friend Ellie are drifting apart because Ellie is sitting on the popular table. Charlotte gets a prestigious part in a dance show alongside some popular girls, so she has to learn to navigate around them. Her story seemed to have the least to do with August and I would have liked more of her story. She's an absolute gem and I could read a whole book about her! I loved her. Are any main characters disabled either mentally or physically? Yes, that's the premise of Auggie's story, which these touch upon. Is there any talk of death? Yes, but it's very age appropriate. It may, however, lead to questions about World War 2 and the Holocaust, so if you're a parent or guardian take note of that. Would I recommend the book? Yes, totally. If you liked Wonder, you'll probably like this - but read that first! How many stars? Eight out of ten.